I went to church on Sunday. Those who know me even slightly may wonder why. If I were in want of saving, I believe that Pastor Paul (Andrew Garman) would be the man to lead me there. Lucas Hnath’s thought-provoking new play, The Christians, at Playwrights Horizons through October 25th, is about religious teaching and faith. When Paul preaches “a radical change,” Hnath never states the obvious. Paul’s charisma as a pastor is rivalled by his associate pastor, Joshua (Larry Powell) whose views differ from Paul’s. There is always more than a touch of the unexpected: in Paul’s sermon to his mega-flock, and in his elders’, represented by Jay (Philip Kerr,) response to him, as well as in the way Paul’s wife Elizabeth (Linda Powell) reacts. Emily Donahoe as a congregant named Jenny delivers her confusion over the new direction in which Pastor Paul is leading his flock in a brilliantly simple scene with equally brilliant simplicity. In fact, the ensemble, under Les Waters’ direction, meet the challenges of Hnath’s intelligent play with superbly intelligent performances. For more information about The Christians, please visit PH’s website. Note: as this is the first play of the 2015-16 season, you can still get a subscription for the year. Who doesn’t love a good romance? An up-by-the-bootstraps tale of success over adversity? 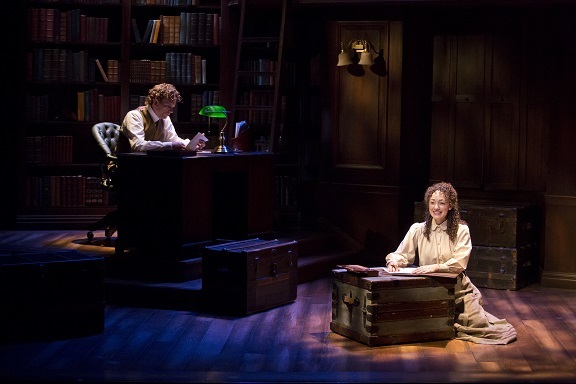 Daddy Long Legs, at the Davenport through January 10th, extended to an open run. (warning: revealing a plot detail here) is a story in which a poor orphan rises beyond her circumstances and falls in love with her benefactor. The drawing room– more accurately, library room– musical, based on a novel-in-letters from 1912 by Jean Webster, Daddy Long Legs inspired the 1955 film with Fred Astaire, before providing inspiration in 2009 to Paul Gordon (music and lyrics) and John Caird (book and direction). 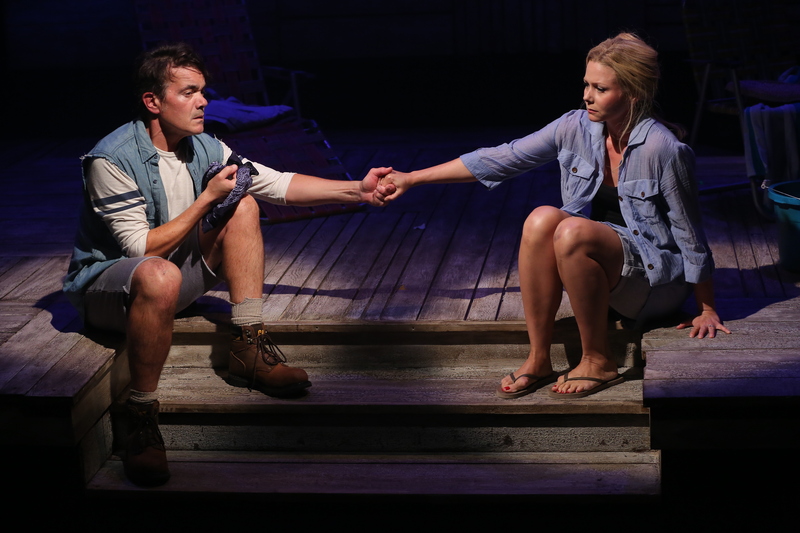 Gordon and Caird’s two-hander premiered at the Rubicon Theater Company and TheatreWorks. 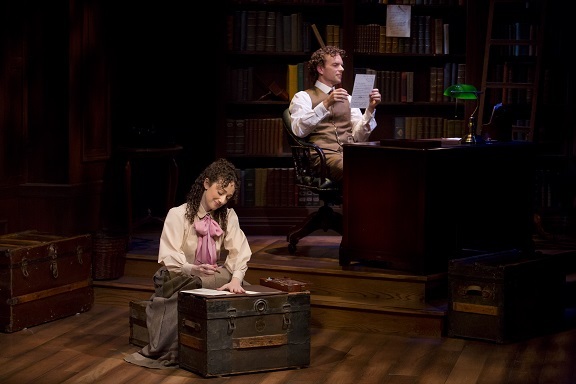 Jerusha Abbott (Megan McGinnis) is an imaginative young woman who has grown up in the John Grier Home. 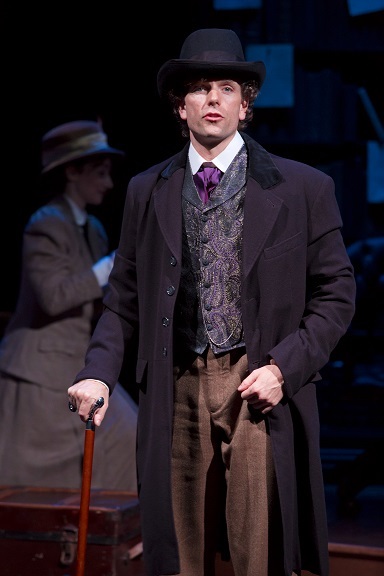 Jervis Pendleton (Paul Alexander Nolan), a young man born to wealth and status, champions her future. He pays for her college education. Their relationship grows as Jerusha writes him letters detailing her progress in school. Both McGinnis and Nolan are charming, giving agreeable performances. Daddy Long Legs is a pleasant entertainment for those with a literary bent. It hearkens up the plot of Jane Eyre, and there is a lot of talk of books and ideas. Daddy Long Legs features a series of monologues, many of them in song, that occassionaly come together in a blend of voices. It’s more narrative than action, more tell than show. 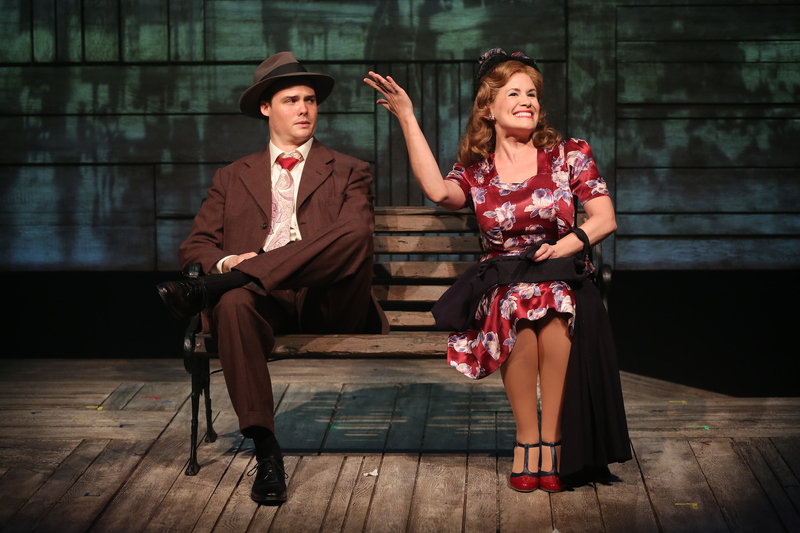 Company, at the Pearl through October 31st, in which these five valiant players take on all twenty-plus characters. trickery to almost unbelievable limits. Dancing is not the only profession that taxes the body. Like other athletes, dancers experience the strenuous demands of a physical career. Waiting to retire at 65 is generally not a norm for them. Career Transitions for Dancers has been here since 1985 to help dancers seek new career paths upon retirement from performing. Their 30th anniversary Gala at New York City Center on Monday, September 28th starting at 7pm, is backed by the Jubilee Orchestra. Among the many featured stars at the Gala performance are two ballet superstars, Robert Fairchild and Misty Copeland, both of whom have extended their reach to Broadway stages. 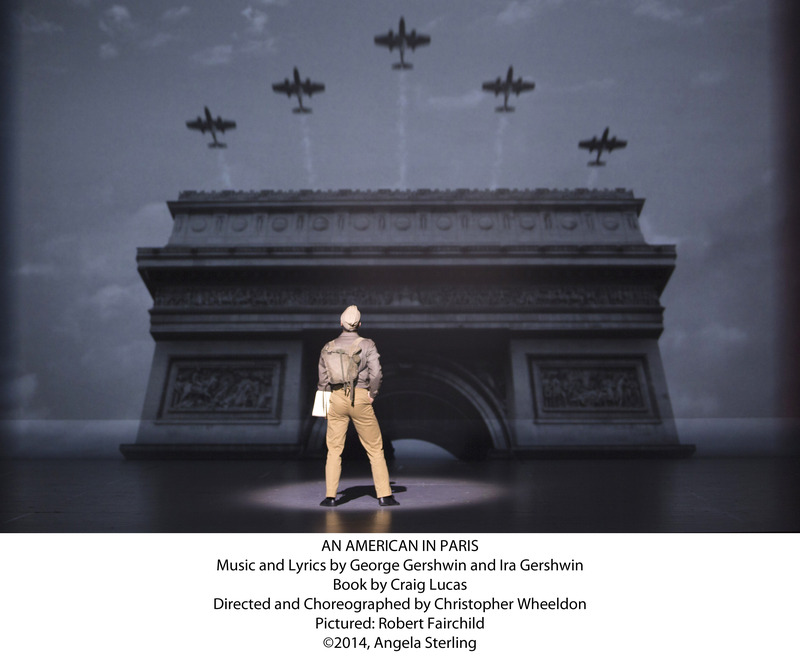 Fairchild, a principal with the New York City Ballet, is the star of the Gene Kelly-inspired An American in Paris. Copeland, American Ballet Theatre principal ballerina, joined the cast of On The Town just before it closed on Sep 6. Shirley MacLaine will be the 2015 Rolex Dance Award Honoree, while past recipients, including Ann-Margaret, Ann Reinking, Bebe Neuwirth, and Tommy Tune (just the shortlist) will be honored as well. For more information and tickets for the 30th Anniversary Pearl Jubilee Gala, please visit the Career Transitions for Dancers website. 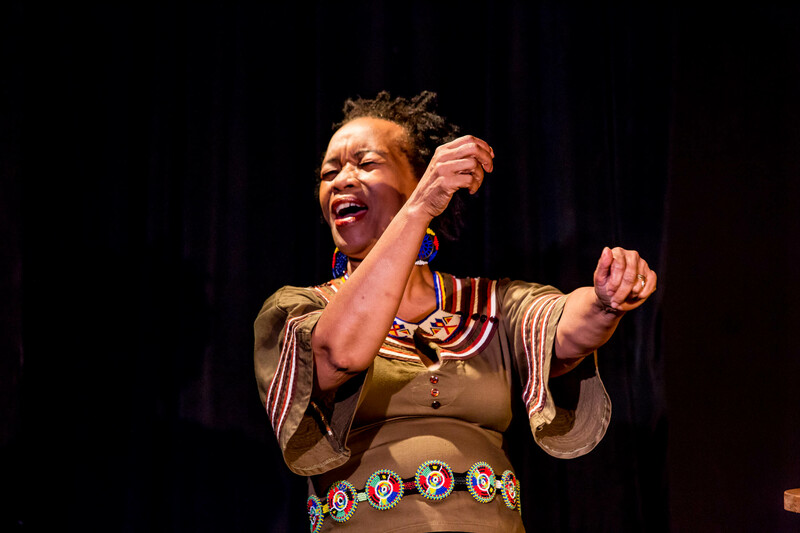 In Africa My Beautiful, at the The Playroom Theater through September 30th,what begins quietly as a tale of an older woman sharing coffee with a younger one morphs seamlessly into an exhilarating evening about pre- and post- apartheid Africa. The older woman, Thuli Dumakude, hails from South Africa. Clad in a black top and skirt adorned with intricate beadwork, she won the Sir Lawrence Olivier award for Best Actress and has spent forty years as a director, singer and actress, performing on Broadway in The Lion King. Oh, and she’s a social activist. Tanyaradzwa Tawengwa, a self-described “suburban kid from Zimbabwe,” is mesmerizing both physically and professionally. A Princeton graduate, she turned down an MTV internship to return to Africa to study native music. After she says this, she unsheathes an mbira (thumb piano) and shows us her mastery. Later in the performance that was workshopped throughout August but feels entirely unrehearsed, she sits at the piano to unleash exquisitely- played Mozart. In between she raises her glorious voice in both African and European song, the African often in tandem with Ms. Dumakude. Ms. Dumakude tells us her name means “I come in tranquility” and shows us her three-year -old self walking around her village accompanied by her grandfather, a wealthy farmer. Told early on that she is grounded in her name, she knows she has a lot to live up to. 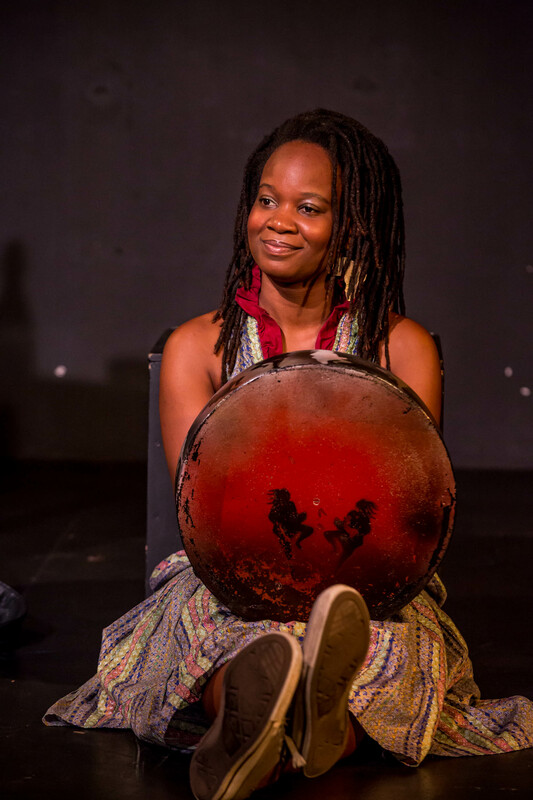 She mimics beading, begins to sing, (she also has a powerful voice), and is joined by Ms. Tawengwa; they clap and drum on wooden boxes that double as seats. As modern as they come in a sundress and gray sneakers with curls spilling from the pile on her head and enormous earrings shaped like the African continent, Ms. Tawengwa is a member of the post-colonial ‘bornfree’ generation. As part of the back-and-forth banter that has the serious subtext of apartheid, we hear a story about an encounter with a lion in the bush; reminiscences about singer Miriam Makeba and other entertainers whose music the government removed from the radio, and plenty of talk about when Zimbabwe was still Rhodesia and blacks lived by strict rules. 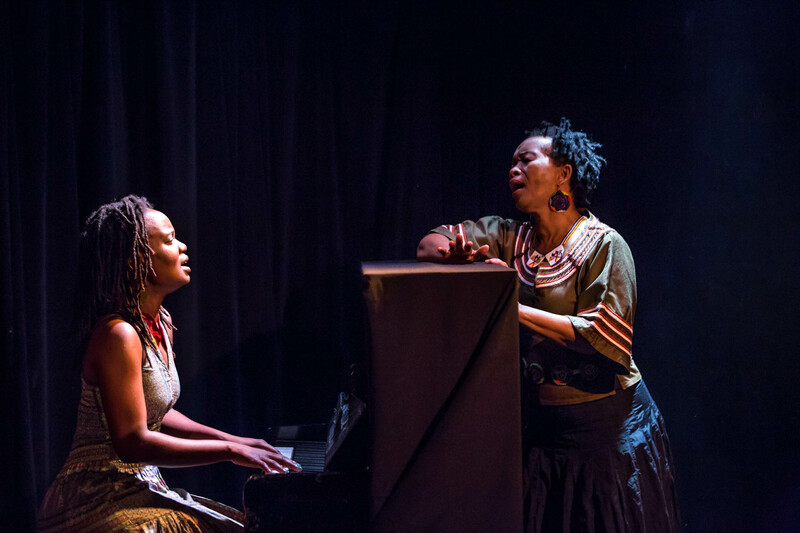 Ms. Tawengwa, clearly never one to take ‘no’ for answer, told her music teacher she wanted to study opera; won music competitions and went on to compose a Shona opera at Princeton, part of which she sings and she plays. Often, the women dance together, stamping their feet and clapping in an outpouring of the old and the new. Throughout the performance, the music draws you in–it took a lot of control to keep me from rising to participate. As recently as twenty-six years ago, after African independence, there were still no African history textbooks. As Ms. Dumakude explains, “the tale of the hunt will always glorify the hunter.” This axiom helps explain how strong, African personalities, that these women exemplify, continue to add their energies to break with oppressions of the past, allowing rich, colorful cultures to shine. The woman seated next to me at the Irish Arts Center is drinking a beer and the couple in front each have a glass of wine. I realize this isn’t going to be a typical evening of theater. The audience is youngish with a smattering of children (which seems a tad odd as what ensues is liberally laced with the f-word and many sexual references) and here for a good time. That’s what they get with Selfie, a one-man sketch comedy, playing through September 27th, and starring “incomparable” Pat Shortt, who won Best Actor at the 2008 IFTA (Irish Film and Television Awards) for his work in the (serious) film, Garage. Shortt, a man with a significant career in film, stage and TV, apparently has serious acting chops and was hailed for his Broadway performance in The Cripple of Inishman. We first see Shortt wearing a blond, curly wig and hat, standing at the side with a press badge and camera around his neck. He mingles with the audience who are delighted to be addressed as “Billy” or “Maureen” and don’t mind when he moves them to other seats. Selfie is stand-up physical comedy broadly played, starting with Shortt as singing undertaker Mossy Burke who hauls people onstage and then marches them into the lobby carrying a coffin– part of the Irish fascination with death, perhaps a way to cast off fear. After the intermission in which sandwiches are passed as part of the “funeral,” Shortt appears in uniform as a member of the Garda, (Irish police force), relaying “anecdotes” including one about a theft from a house where the occupant left the window wide open. This bit includes projections on a screen that were greeted with hilarity. At many times during the evening the stage filled with smoke (which made no sense to me.) 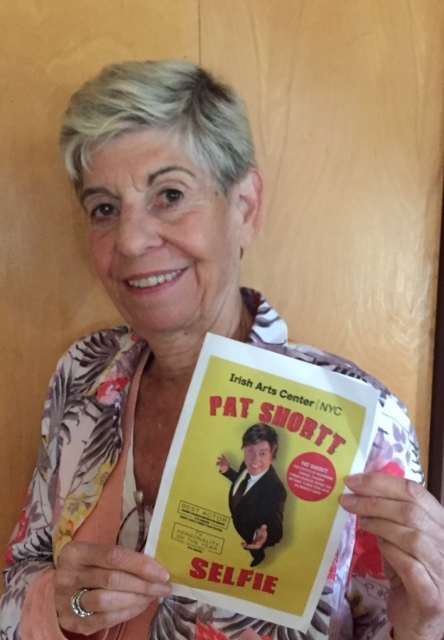 Shortt accompanies himself on the guitar and many of his songs, including The Jumbo Breakfast Roll, a number he’s famous for, and Selfie, about–wink wink nudge nudge– masturbation, are both musically engaging and pretty funny. Clearly, Shortt is enormously talented, although I had trouble getting his humor. Selfie seems to make the most impact if you’re Irish or have Irish family in the way that many Jews idolize Jackie Mason (humor I also don’t cotton to.) The ways in which the actor pokes fun at himself and others is an acquired taste and, as with some other Irish offerings, I suspect I’m not the only American who has a little trouble understanding his accent and many references. If you’re Irish, enjoy the craic (fun); if not, well, Stephen Colbert is back and there’s always the Donald. It’s easy to confuse desire with longing. Tennessee Williams often deftly treads that line in his lyrical story-telling, as he does in his plays. 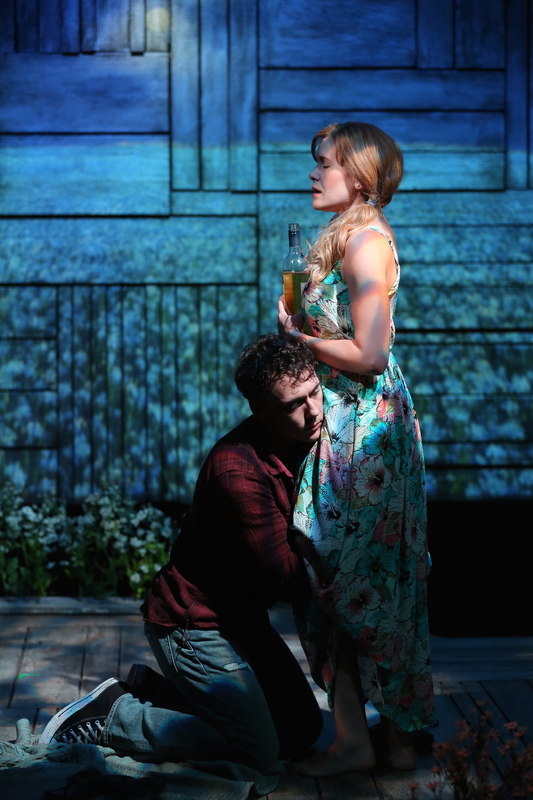 Fans of Tennessee Williams are treated to 6 servings of plays built from his short stories in The Acting Company’s production of DESIRE, playlets based on Williams’ short stories, at 59E59 Theater’s 5A series, running through October 10th. The playwrights, undaunted by their task to recreate what Tennessee has left for them, are mostly familiar names, most of whom don’t quite get the recipe right. Only one of them, John Guare, dug right in to The Glass Menagerie. In his You Lied to Me About Centralia, based on the short story Portrait of a Girl in Glass, he regales us by revealing what that dinner at the Wingfields looked like to their guest. The “Gentleman Caller,” Jim (Mickey Theis) tells his girl Betty (Megan Bartle) about his dinner with “Shakespeare,” and his mother and sister. Betty, in her turn, tells him about her trip to visit her Uncle Clyde to ask him for a gift so they could afford to buy a house. Elizabeth Egloff covers Tent Worms from a Williams story from 1980 of the same name. Her adaptation looks at destiny, disappointment and failure. Egloff’s treatment is the most satisfying of the items on the bill. In Tent Worms, Billy (Derek Smith) obsesses over the worms that have taken over the trees in his and Clara’s (Liv Rooth) Cape Cod rental. Clara tries to shepherd him back to his typewriter but he is hell-bent on eradicating the pests, whose fate somehow parallels his own. Rebecca Gilman transposes a 1939 short story to the present, with characters engaging in such contemporary activity as texting each other. In her The Field of Blue Children, students at an Alabama college are divided as highbrows and sorority. Layley (Megan Bartle) traverses the categories by taking a poetry class and going out with Dylan (John Skelley), a poet who is dating snarky fellow intellectual Meaghan (Kristen Adele). “Behold the New South rising,” Dylan recites and then crosses out the line. 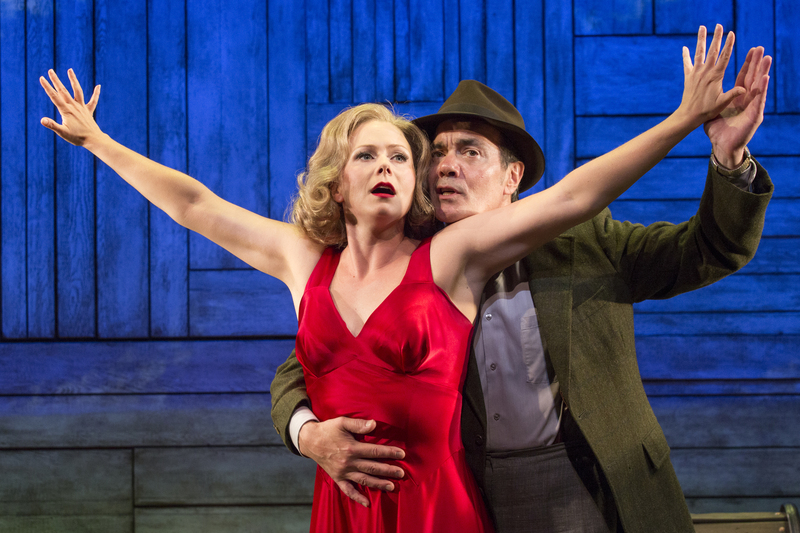 Anna’s (Liv Rooth) scarlet evening dress is her attempt at romance in David Grimm’s Oriflamme, adaprted from the eponymous 1974 story. 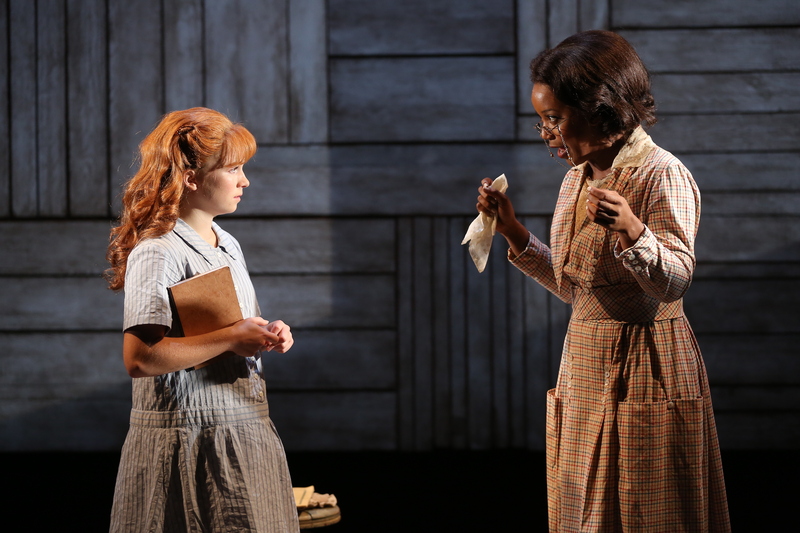 If Anna has the airs of a Blanche du Bois, Rodney is her Stanley. Desire Quenched by Touch is based on Desire and the Black Masseur. Like the original, Marcus Gardley’s play is freely laced with stereotypes. Grand (Yaegel T. Welch), a musician turned masseur, is being questioned by Detective Bacon (Derek Smith) about the disappearance of his client Burns (John Skelley). This lurid little tale is full of humor , and twists. Sad to say, none of the plays in DESIRE rise to the level of a Williams at his best, but many capture the rich and unexpected flavors of his art. The plays, like the stories from which they are sprung, are often odd. Sometimes desire, and DESIRE as well, is tinged with intimations of mortality. The Resemblance Between a Violin Case and a Coffin is whimsical. Beth Henley, no stranger to the Southern tale, speculates on the story of a piano prodigy, Roe (Juliet Brett) who abandons imagination and play with her brother Tom (Mickey Theis) to practice a Chopin violin and piano duet with Richard Miles (Brian Cross). Director Michael Wilson pulls together the divergent works offered under the umbrella of DESIRE. For more information, please visit www.59e59.org.